So, if you can, please take a minute and donate a little something on my Operation: Pink Sky charity page. 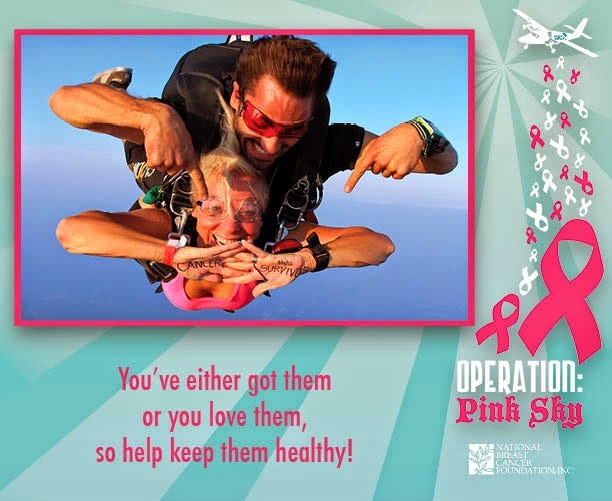 "Chicagoland Skydiving Center is raising funds to help with the National Breast Cancer Foundation's mission to save lives by increasing awareness of breast cancer through education and by providing mammograms for those in need. Operation Pink Sky is an event that takes place on June 7, 2014 at CSC. From skydiving to sand volleyball tournament to a party with live music, there's a way for everyone to help this important cause." Sky diving is definitely one of those things that sounds like fun but I don't know if I could ever actually do it. Good luck! !